FAA drone regulations: The agency might not have the authority to regulate UAVs. Maybe the FAA doesn’t have the authority to regulate unmanned aerial vehicles. In defense of Lakemaid’s beer-delivery drone. There’s an old Emo Philips joke about trusting advice from the government: “I pleaded guilty on advice of counsel. Which is the last time I listen to a prosecuting attorney.” Amazon, Lakemaid Brewery, and FlowerDeliveryExpress.com should listen to his warning. Just because the FAA says it has the authority to regulate drones doesn’t mean it actually does. Currently, the Federal Aviation Administration maintains that anyone operating a drone in the United States must obtain an experimental aircraft permit, which severely limits the number of active drones and the parties permitted to fly them. However, a closer look at the statutory and regulatory laws governing the FAA suggests that the administration may not actually have the authority to require those permits or limit drone usage. 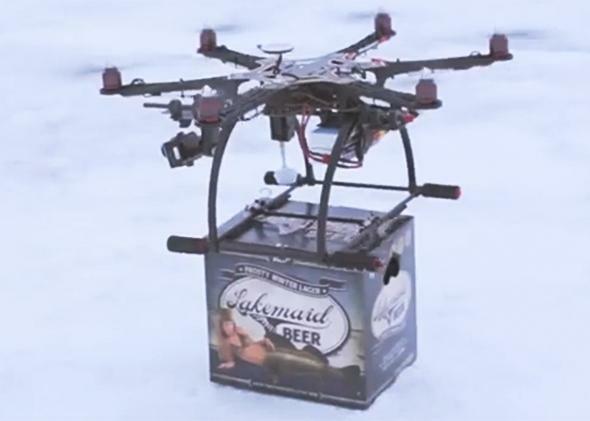 If I had a company that wanted to deliver beer by unmanned aerial vehicle (and I wish I did), there are three points I’d raise in my defense against fines levied by the FAA for unlicensed drone delivery. The definitions for the portion of U.S. code that governs air commerce and safety, found in 49 USC § 40102, do not define UAVs. The definitions for the regulations that govern aeronautics and space, found in 14 CFR 1.1, do not define UAVs, either. If the law creating the FAA’s governing authority does not even address UAVs, the FAA’s authority to regulate UAVs is highly suspect. In an email, Les Dorr of the FAA states that “the FAA is responsible for the safety of the National Airspace System (NAS). This includes all NAS users, including those operating unmanned aircraft systems.” However, he also admits that “we are currently using regulations for manned aircraft in approving [UAV] operations.” There is a legitimate question as to whether the FAA can use regulations that were intended for manned aircraft to regulate UAVs, particularly when those regulations do not define, address, or consider UAVs. It’s a potentially dangerous precedent to permit the government to police one form of technology using a law that was not written to address that technology. It’s akin to using telegraph laws to regulate the Internet. 2) Even if it has the authority to regulate UAVs, the FAA has not taken the necessary steps to do so. In fact, it’s published other documents suggesting that UAVs are permissible. Admittedly, Dorr has a point and language in the U.S. code appears to grant the FAA broad authority that may encompass UAVs (and anything else that flies, like paper airplanes and spitballs—watch out, third-graders). For example, 49 USC § 40103(b)(1) states, “The Administrator of the Federal Aviation Administration shall develop plans and policy for the use of the navigable airspace and assign by regulation or order the use of the airspace necessary to ensure the safety of aircraft and the efficient use of airspace.” That’s pretty broad, and arguably the FAA could rely on that to issue regulations and orders that directly govern UAVs. That’s essentially what the FAA is doing here. Until the FAA Modernization and Reform Act of 2012, Congress never addressed UAVs. (More on that law in a minute.) Yet, according to Dorr, the FAA has regulated them since 1990. Although Dorr notes that a rulemaking process for “small” UAVs preceded the 2012 act, for more than 20 years the FAA has tried to regulate all UAVs without the necessary procedures that would permit public scrutiny of proposed policy decisions. In some instances, the FAA has attempted to regulate UAVs by relying on existing regulations that are stretched and distorted. For instance, it uses regulations governing experimental aircraft and the flight crews of experimental aircraft to justify the current permitting system, which is consistent with Dorr’s acknowledgment that the FAA uses regulations governing manned aircraft to regulate UAVs. Of course the whole point of an unmanned aerial vehicle is that there is no flight crew, but no one seems to have pointed that out to the FAA. In fact, one could argue that it’s voluntary to listen to the FAA about drones. In its literature discussing its governance of UAVs, the FAA often refers to Advisory Circular 91-57, which addresses model airplanes. However, AC 91-57 merely “outlines, and encourages voluntary compliance with” the model airplane standards it states (so I guess paper airplane–slinging third-graders are safe). I think “voluntary” is probably a more honest representation of FAA authority over UAVs as well, absent congressional approval or at least publicly vetted regulations. Similarly, there is reason to think that if you keep your beer-delivery drone flying low, you’ll be in the clear. In its documentation addressing a redesign of the national airspace in the Northeast, the FAA provides a useful outline of the NAS, including Class G airspace, which goes from the ground up to at least 700 feet in the eastern United States. The document notes that the FAA’s air traffic control (ATC) system “does not have the authority or responsibility to manage … air traffic within this space.” That seems to state outright what the lack of specific statutory and regulatory authority already suggests: The FAA can’t regulate UAVs, at least within that Class G space. Dorr disputes this, pointing out that “Class G is often defined as uncontrolled (no ATC services). However, uncontrolled does not mean unregulated.” This is somewhat inconsistent with the NAS outline, which clearly states that ATC does not have the “authority” to regulate air traffic in Class G air space. As most delivery drones would only need to operate in Class G, if the FAA does not have the authority to manage that area of the skies, the FAA does not have the authority to manage most delivery drones. 3) Congress did nothing to confirm the FAA’s current authority to regulate UAVs when it passed the FAA Modernization and Reform Act of 2012. In passing the 2012 act, Congress finally defined “unmanned aircraft” and ordered the FAA to create a regulatory system to permit UAVs. Those regulations should be in place around September 2015. The FAA has said it expects to release proposed rules addressing smaller UAVs later this year, but so far the administration has run behind in meeting preliminary deadlines established by the act. The act also requires that the secretary of transportation develop a comprehensive plan to “safely accelerate the integration of civil unmanned aircraft systems into the national airspace system.” That plan was released (late) on Nov. 6, 2013. However, while the act grants authority to the FAA to regulate UAVs, nowhere in it did Congress state that the FAA already has authority to govern UAVs and that Congress would like the FAA to regulate them differently. Congress only called for the FAA to “integrate” UAVs into the NAS. There’s no reason to believe that UAVs are currently prohibited from the NAS based on the language Congress used. Rather, it looks like Congress wanted to give explicit authority to the FAA to regulate UAVs to integrate them into the fabric of the NAS with traditional airplanes and aircraft. Until 2015, or some later date, when we see the FAA’s rules, this legislation doesn’t give the FAA any more authority to govern UAVs than before the president signed it. Admittedly, there is no obvious provision in federal law prohibiting the FAA from regulating UAVs, and Les Dorr and the FAA in general are adamant about the FAA’s authority to ensure safety in the NAS. However, there are plenty of weaknesses and gaps in the foundation of the FAA’s legal authority to govern drones. Until the 2015 regulations put this issue to rest, there is a legitimate question about the legality of flower-, beer-, and Kindle-bearing airborne robots. I’d like to see someone challenge the current permitting system now and jump-start the new drone economy.